Available in 28 OEM colors Valspar's enamel includes a rust-fighting additive. The blistering sun and the blinding snow have a tough time with Valspar's new Tractor and Implement Paint. Available in 28 OEM colors, the heavy duty enamel is designed to stand up to outdoor conditions for years, and it fights rust at the same time. Designed to meet original equipment maker's original specifications, the high-gloss, abrasion-resistant paint is a multipurpose product for farm and ranch equipment, wood and metal trim, pipes and railings, and it's non-toxic to livestock. Valspar's T&I paint comes in gallon and quart containers, as well as aerosol spray cans. 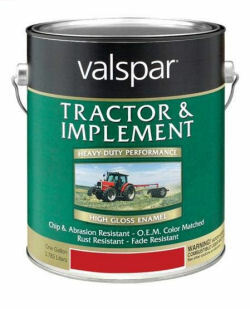 Valspar's Tractor and Implement paint comes in 28 OEM colors and provides a heavy-duty anti-rust quality. For more information on this coating, call (866) 222-8714, or click on: http://www.valsparglobal.com/val/resident/agricultural.jsp.